All afternoon classes will be cancelled today, Wednesday April 24th, due to a severe weather system. The safety of our families is our highest priority. Stay safe and dry! Our 9-week Spring Session starts on April 1st and goes through June 3rd. Register NOW or schedule a FREE demo class! Click here to see photos from our 10th Anniversary Celebration and here to see the event featured on Time Warner Cable news. Since opening our doors in 2005, we have had over 15,850 families participate in our classes! Thank you to all of our families for making music together with us and for the opportunity to be a part of your child's development and your family's life. Sign up to receive weekly posts from our Heartsong teaching staff where they share their wisdom and expertise on early childhood music development. See us in the Austin American Statesman and Community Impact Newspaper. 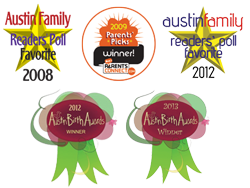 Click here to see us in the Austin American Statesman. Click here to see us in Community Impact Newspaper!